IISM has undertaken a revolutionary redesign in management education through innovative academic methodology and delivery systems for students to take the fullest advantage of the exceptionally rigorous and demanding nature of the customized curriculum. With its collaborative arrangements with the Sports Industry and global sporting industry icons as its advisers, IISM is the embodiment of underlying philosophy of ‘Global Mindset, Indian Roots’. 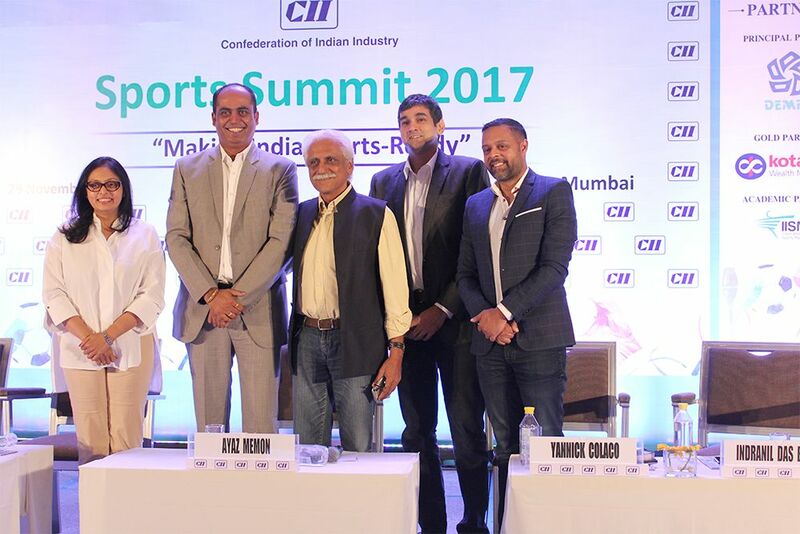 Partnering with CII for its second edition of “Sports And Entertainment Summit 2017” as “Academic Partners” is also an extension of its efforts to provide students with un-matched exposure from the industry and contribute towards Development of Sports in our nation. The event that was held at Hyatt Regency, Mumbai on 29th November 2017, commenced with an opening address by Mr. Shrinivas Dempo (Summit Chair & Chairman & MD, Dempo Shipbuilding & Engineering). “Development at grassroots level, a must for Sports to grow in India” said Laxman who affirmed how its vital to have a good mentor along with a good infrastructure. Next, we had our Founder-Director Mr.Nilesh Kulkarni along with an illustrious panel of speakers- Mr.Yannick Colaco (VP & MD, NBA India) , Ms.Vita Dani (Co-owner, Chennaiyin, ISL franchisee & Chairperson, 11even Sports , Table Tennis League) and Mr.Indranil Das Blah (Chief Operating Officer, Kwan Entertainment & Marketing Solutions) discuss about the “Role of Academia and Government in boosting Sports”, chaired by Mr.Ayaz Memon. As the discussion unfolded, we got some more insights on the integration from school curriculum, grassroot level challenges and how can we build the right infrastructure. We then had, Mr.Vinit Karnik (Business Head-Entertainment, Sports & Live Events, GroupM), Mr. Charu Sharma (Director, Pro Kabaddi League) , Ms.Vita Dani, Mr.Joy Bhattacharya (Project Director, FIFA U-17 World Cup) and Mr.Sandip Tarkas (Former CEO – Sports, media & special projects, Future Group & CEO, Bengal Tigers Kabaddi) discuss about the “New Sports Leagues and Innovative Marketing techniques” and how it is taking off significantly in India. As we know, sports unlike other areas of CSR provides companies far more visibility. Sports is one of the cheapest real estate for visibility in CSR due to the media coverage. Mr.Viren Rasquinha (CEO, Olympic Gold Quest), Naghma Mulla (COO, EdelGive Foundation ), Ashwini Saxena (CEO, JSW Foundation) and Deepthi Bopaiah (Executive Director, Go Sports Foundation) shared some interesting facts about the Investment Opportunities that prevail in Sports through CSR Funding. This mega event that had the presence of the Who’s-Who of the industry was a perfect learning platform for IISM students and helped them broaden their perspective. It’s through such partnerships and collaboration, that IISM wishes to contribute towards the development of sports in our nation.